The records of the Office of the Dean of the Faculty of Medicine are the product of the administrative activities of the Deans of Harvard Medical School, during the years 1828-1904. The collection consists of correspondence, petitions, reports, financial records, and certificates and chronicles education, administration, and committee activities at Harvard Medical School. Correspondence from Harvard University President Charles Eliot and the Harvard Corporation is contained in the collection, including a letter from Eliot outlining medical education reforms at the institution. 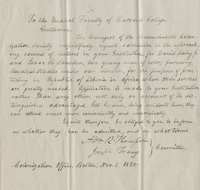 Correspondence and petitions relating to the admission of women and blacks, in particular the case of Martin Delany, is included in the collection as well. The collection also contains records relating to the Medical School’s relocation to facilities on Boylston Street in Boston, Mass.